"It was known that escape was every slave's desire"
A&E and The History Channel always do a great job of making learning appear rather effortless, and if I was struck by absolutely nothing else while watching the Underground Railroad documentary it was that the thought of Americans buying and selling other humans is a damn hard concept to grasp. But it happened. There's no changing of history, and the ugliness of our nation's past is something that maybe we all need to be reminded of from time to time. Like most A&E/History Channel pieces, Underground Railroad is a solidly structured 90 minutes of educational content, and manages to show that there was some good to come out of all of the inhumanity. It came most significantly in the form of the anti-slavery Abolitionists, who carved out what is likely this country's first civil rights movement, and through the so-called "underground railroad," which was a loose connection of disparate, like-minded people spread across the country who would risk imprisonment and fines by helping and abetting runaway slaves. Alfre Woodard narrates a number of sad and inspiring tales of bravery, all amidst closeups of old photos and drawings, as well as the occasional re-enactment (which are thankfully kept to a minimum). Various historians and other knowledgeable types pop in and out to contribute added background, and the presentation covers the arrival of the first group of slaves in this country, courtesy of the Spanish in the early 1500s, up through the outbreak of the Civil War. It's hard not to be moved by these brave stories, and the actions of history-book friendly names like Harriet Tubman and Frederick Douglass are counterbalanced with less well known abolitionists, such as William Still. The presentation, though, becomes a bit repetitive with a heavy reliance on the old Ken Burns' slow-pan-across-photos-and-drawings technique, and the stiffness of Woodard's wide-eyed intros to each new chapter are a little distracting. This may not be the most aesthetically polished A&E/History Channel project, but the material is certainly substantive. Slavery was one of, if not the defining cause of the war between the states, and the work of the Abolitionist movement to help, hide and relocate escaped slaves is a bittersweet and uplifting tale, one that clearly shows that this was not a simple black versus white issue. 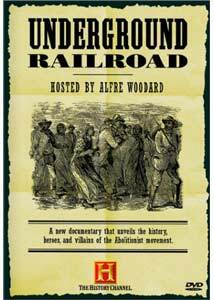 Rather, Underground Railroad shows that there was something that brought out genuine human decency and bravery amongst both blacks and whites, who put themselves at risk so that others could be free. Image Transfer Review: Presented in 1.33:1 full-frame, Underground Railroad will likely not be remembered as the finest moment in the history of A&E DVD releases. Excessive shimmer and haloing, which is especially noticeable on the numerous paintings and drawings used during the narration, is jarring. That consistent flaw notwithstanding, colors and fleshtones during the interview segments look solid and natural. Audio Transfer Review: There is an especially nice-sounding English 2.0 Dolby Digital Stereo track here, one that sounds fuller and more expansive than most television documentaries. A well-mixed presentation all the way around, from the dialogue to the score elements. Extras Review: The folks at A&E and The History Channel have done a fine job of tacking on some relevant additional historical info onto this disc, and the main plus is a full-length episode of Biography (42m:24s), highlighting abolitionist Frederick Douglass. Also provided, for your reading pleasure, is on-screen text of The Emancipation Proclamation, background info on the Dred Scott Case, a Harriet Tubman biography, and a Historical Timeline of key events. The disc is cut into 13 chapters, and does not have subtitles. Underground Railroad covers a long, ugly era in the history of the United States, and the stories of those who rose up against it is handled with the kind of even-keeled dignity you would expect from A&E and the History Channel.